Not sure where this month left but very happy for this extra day. The E-Team has prepared a blog hop for you today to celebrate Leap Day. It only comes every four years for it should be special. The E-Team dug into their paper craft arsenal to get ready for Part 2 in our series we call, GET YOUR FAUX ON! The Blog Hop will feature Faux Marble. Marble is a metamorphic rock composed of recrystallized carbonate minerals, most commonly calcite or dolomite. Geologists use the term "marble" to refer to metamorphosed limestone; however stonemasons use the term more broadly to encompass unmetamorphosed limestone. Marble is commonly used for sculpture and as a building material. Let's build on that. Paper crafters have been creating faux marble finishes to enhance their projects. There are so many different ways to achieve the marble look with inks, paints, papers, and more. 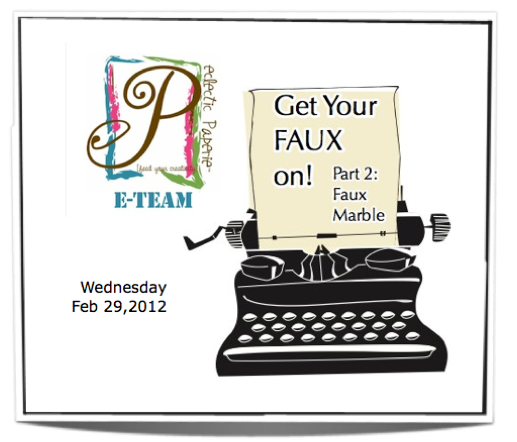 I challenged The E-Team to create a faux marble look on their projects. 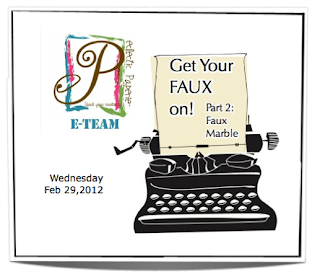 Visit the participating E-Team Blog Team members to see what Faux Marble paper craft she came up with. Leave a comment for a chance to win an eclectic Paperie Gift Voucher for $25. You have from today, Feb 29th to March 2nd, Friday to visit each E-Team blog hop participant. Two random winners will be announced on Saturday, March 3rd. Linda Ledbetter is not joining us today but make sure you check out Studio L3 to see what she is up to. I love the look of Faux Marble and amazed at all the different ways that you can achieve this look. I had an idea for this reviving an oldie, but goodie. I've been using this technique ever since it was first introduced to me. I've done with my Girl Scouts as part of their art lessons, and my kids have enjoyed, too. It's great for creating all kinds of backgrounds on paper since no two are ever the same. I am referring to the Shaving Cream Technique. With some plain white cardstock, foam shaving cream and all those inkers you have, you can create some beautiful, one of kind backgrounds. I used some pie tins to get started. Plain foam shaving cream works best. Your paper may smell good afterwards, too. 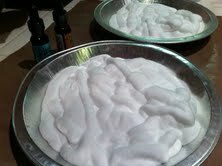 Usine some Distress Re-Inkers, I dropped some Tumbled Glass and Wild Honey into the foam shaving cream. With a toothpick or bamboo stick, lightly swirl to mix up the colors...but only a little. 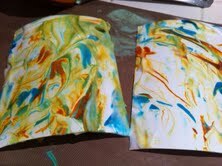 I had cut my white cardstock into A2 size squares and just lightly set them on top of the shaving cream mixture. Use a spatula, your scrapper or even you fingers to swipe the shaving cream off of the cardstock. You will be left with some unique backgrounds. 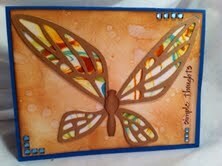 I thought these papers would be great to use with this butterfly die called Fanciful Flight. It was just what the wings needed. Here are two ways that I used the various backgrounds that I was able to create with the Re-Inkers and shaving cream. The Studio 490 stamp, Visions of Art, suited the project well. Don't forget to see what The E-Team has created for this Blog Hop. Have a great Leap Day and GET YOUR FAUX ON! Beautiful uses of your faux marble, Daisy! LOVE that butterfly!! Your cards are fabulous ! I like the butterfly die also , great use for the marble look ! Has beed a fun blog hop !! Beautiful results! I really like the stained glass butterfly- wonderful effect. I've SO got to try this, particularly with my 4yr old. 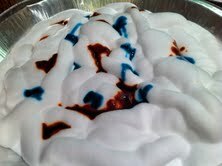 I've done ink on water marbling back in a college papermaking class but I have yet to try the shaving cream method. Really pretty, thank you so much for sharing it and the chance to win. Love both projects, but I REALLY like the one with Wendy's stamps!! Great idea! I will have to try it. We are snowed in today and I was looking for something to do! OMG, why didn't I think of using that butterfly die...... perfect. The cards are gorgeous. I think I'm going to try to talk the girls out of their faux marble stash, :-). Oh how cool. I love learning new ways to use marbled papers! Beautiful backgrounds and what a great way to make the butterfly wings! What a cool technique! This came out so pretty. Thanks for sharing. Great cards. 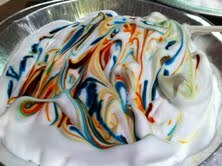 I have always loved the results from marbling with shaving cream. I haven't made any in a long time and I think my studio would like to get freshened up with the scent. And I have a can of shaving cream on my shelf...what a perfect time to use it! Thank you for the reminder! Love your use of Studio 490 stamps! What a fun idea to do with your children!!! Thanks for sharing! I am going to try this technique with my granddaughter. Beautiful projects! 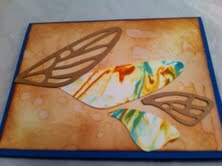 Love the faux marble look with the butterfly.. the cutouts really showcase it! Beautiful!!! I love this technique and it's fun to do with the grandkids! The bonus is that I get a bunch of cool backgrounds when they get done playing! Loved seeing all the different takes on marbling! Thanks for sharing! Love that butterfly! I have not seen this technique before and it's cool. Lovely cards! The Vision of Art set is fabulous! Love your faux marble and your cards are great. Very beautiful projects. Love that technique. Thanks for sharing, Johanne L.
Wonderful uses of your faux marble! I really love the colors and how the background of the Art card turned out! Great examples, Daisy!! I commented earlier on one of the girl's blogs that this is my all time favorite blog hop and I'm repeating it here to you! Love it. What a fun blog hop! I'm loving all the great marbling techniques. I really like your art card. It's so cool and the marbled background is perfect for that card! Thanks for the great inspiration. i haven't played with this shaving cream tech for a long time. love your projects. I love the shaving cream technique you used. The colors are so bright and happy. Your butterfly is fabulous. The DT also did a wonderful job with the faux marble. Thank you all some much. I have many bottles of alcohol ink, but never knew how to use them. I love it!Your papers are gorgeous and it looks like so much fun.Now to see if we have any shaving cream. you know what i like about blog hops is that they remind you of techniques you haven't done in a long time - love this one- better go get out the shaving cream - thanks daisy for the chance to win! These cards are fantastic. Love the butterfly and those backgrounds! What a fun hop!! Love the stained glass look to the butterflies! Oh, Daisy, I love the way you used the shaving cream background for the under part of the butterfly wings. What a great idea! Love those creations. What a fun hop! Thanx for sharing. It's been awhile since I've done this but the results are always amazing! Fabulous inspiration! Love your cards, that stamp is so cool for that background! Another cool Blog Hop Ms. Daisy ! This looks like fun! Love the look on the butterfly wings.... fabulous!